The TransAsia Airways flight GE235, carrying 53 passengers and 5 crew onboard, careened into the Taipei river shortly after taking off from the Taipei’s downtown Sungshan Airport, killing at least 26 dead. The French-Italian-built ATR 72-600 took off at 11:53 AM on Wednesday en route to the Taiwanese-controlled Kinmen islands and lost control soon after. 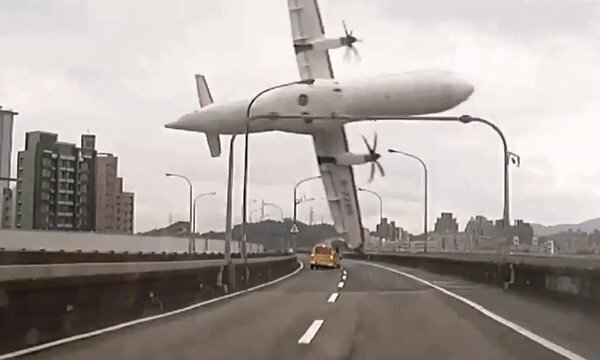 Dramatic videos of TransAsia flight in its last minutes of flight, captured by motorists and car passengers, have surfaced on the social media platforms like Youtube, Twitter and Facebook. The plane is seen slipping between the buildings by meters, sharply banking on its side and clipping a taxi and an overpass with its now-vertical wing, before plunging into the Keelung River. Rescue efforts are on and the Taiwan’s Civil Aeronautics Administration has confirmed that 26 people are dead, 15 have been rescued and 17 are missing. The missing people could be either dead in the submerged fuselage or could have been washed away by the river. About 300 rescue personnel comprising mainly of military crews and members of the media stand on the banks of the shallow Keelung River doing their part. The message “Mayday Mayday engine flameout” was the last communication from the pilot, which provides no further information regarding the reasons of the fire. An interruption of fuel supply to the engine or a faulty combustion can cause a flameout. However, the baffling aspect of the situation is that these type of twin-engine aircrafts are designed to work on one engine when the other fails. This is TransAsia`s second French-Italian built ATR 72-600 that has crashed in the past year. In the previous incident on July 23, 2014 another ATR 72-600 crashed in the Taiwan-controlled islands of Penghu, killing 48 people. The reasons for the crash, are yet to be determined. The aircraft involved in Wednesday`s incident had not even completed its one year of service with the airline. Furthermore this incident is the latest in a string of mishaps which have hit the Asian Airlines in the recent past. France, where the aircraft was manufactured, has promised to send a team of investigators to determine the the cause of crash.